Nippon Seisen's spring wires are manufactured using strict quality assurance, and they are well-regarded by our customers due to the wires' consistent workability. Our originally developed steel grade gives them high strength, strong heat resistance and super non-magnetic properties, giving customers lots of added value. Straightened Spring Wire is a material, developed as the first of its type in the world by Nippon Seisen, which has undergone straightening processing. It has a great reputation in applications such as torsion springs, pins, and filigree. 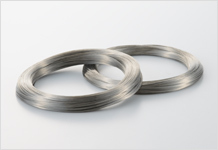 Nippon Seisen's high strength spring wire is well-loved, and is used in areas such as piano wire replacement, abbreviation of plating processes, compact applications, and weight-reduction applications. * For more information, please contact us. 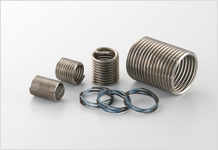 Typically, SUS316 is used for stainless steel springs requiring special nonmagnetic properties. However, for applications such as the latest precision electronic devices, precision electronic medical parts, needle detector, this is not enough protection against the influence of magnetic fields. Nippon Seisen's highly nonmagnetic spring wire will not be affected by magnetic fields in any area of use. 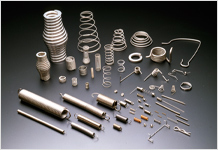 Depending on the type of steel selected, Nippon Seisen's heat resistant springs can continue to function as springs under all sorts of temperature levels (up to 750° Celsius). In addition, depending on the type of steel selected, new value can be created through possibilities such as decreasing cost or increasing corrosion resistance. Nippon Seisen's easy identification spring wires include brasscolor wire and black colored wire. They both have good reputations for their uses in situations such as telling apart wires with similar shapes and diameters, or where black is required (such as internal parts of a camera). * Can be applied to any type of steel. 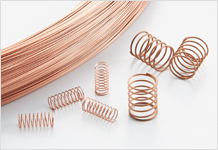 Nippon Seisen can manufacture springs for any use into differently shaped wires, such as flat or squared wires. Differently shaped wires can help with reducing space requirements or increasing strength through their shape. "Hydrogen embrittlement resistance" will be a keyword for high strength metals in the next-generation hydrogen-based society that will develop around fuel cells. Nippon Seisen has become the first in the world to develop a new steel type which can withstand use in a hydrogen environment. With the increase in environmental issues, use of hazardous materials is becoming more and more restricted. Responding to these conditions, Nippon Seisen has developed a beryllium-free high strength conductive spring. The strength matches that of copper beryllium alloy, and its solder wettability is greatly increased. * For more information, please click here.